In a large bowl, combine asparagus with olive oil, thyme and lemon zest. Toss gently to coat. Place asparagus on a baking sheet and roast for about 15 minutes, or until tender. Set aside to cool. Add olive oil, rice vinegar, garlic, thyme, lemon juice and lemon zest into a small bowl and whisk to mix thoroughly. In a medium size bowl, toss avocado gently with the lemon juice. Then add the grape tomatoes, bell pepper slices and red onion slices. Pour 1/4 cup of the dressing over the mixture and toss gently. Set aside. Place red lettuce on the bottom of a bowl. 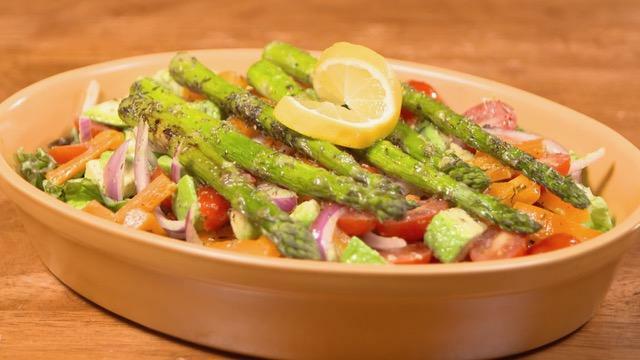 Add avocado mixture and top with roasted asparagus. Drizzle with a little more dressing and serve with extra dressing on the side.